Sometimes we can all be blinded by love that all reasoning goes out of the window. This is why we all need to read a bit of relationship advice every now and then to make sure that we stay grounded. We have gathered the best advice from around the internet to help improve your relationships and to make sure that you don’t waste time being with the wrong person. Get ready to step-up your romance game! When you find the right person, they really don’t need to be chased. If someone is playing games and making you chase them, they really aren’t worth your time! Move on from them. 2.) You are always good enough! We often hear people asking if they are good enough for someone. Why don’t you swap it around and ask if THEY are good enough for YOU?! If you are always asking if you are good enough, you are going to end up with someone who makes you feel less than you are. Know your worth! Firstly, you need to focus on yourself, if you are trying to change others, there’s probably something you aren’t happy with yourself. Secondly, if you are trying to change your partner, you don’t love them. You love the IDEA of them, but not them. Hate to break it to you but if you are trying to guess if someone is into you or not, they aren’t. They will show their interest and make effort for you. If this isn’t clear then it’s time to move on. No hard feelings! You never know what someone you are dating or in a relationship with will do next, so there’s no point stressing over anything! The only thing you can control is how you react to it. So, try to react to everything with love rather than anger. It will change your life and make everything much easier. There’s a reason all of their exes are crazy and it’s probably because they are the common denominator. Steer clear before you become another crazy ex. Surprisingly, you are actually not half a person but a WHOLE PERSON. Find someone who loves you as a whole person and helps you grow together. Don’t diminish yourself to half a person, come on. If you don’t love yourself fully, how can you expect to love another person fully? You don’t need to have your entire life figured out but if you love everything about yourself, you will never let anyone bring you down. Trust us, the right person will come into your life the second you love yourself. The second we heard this quote our entire world was blown. What’s the point of searching for the love of your life in a club? Why would someone looking for a partner to dedicate themselves to, be picking up people in a club for one-night stands? Think about it, it doesn’t make sense. If you catch yourself teaching your partner how to behave or how to treat you, run for the hills. You should have to teach an adult human that they shouldn’t be late or shouldn’t yell at you. Don’t tolerate behaviour like this. 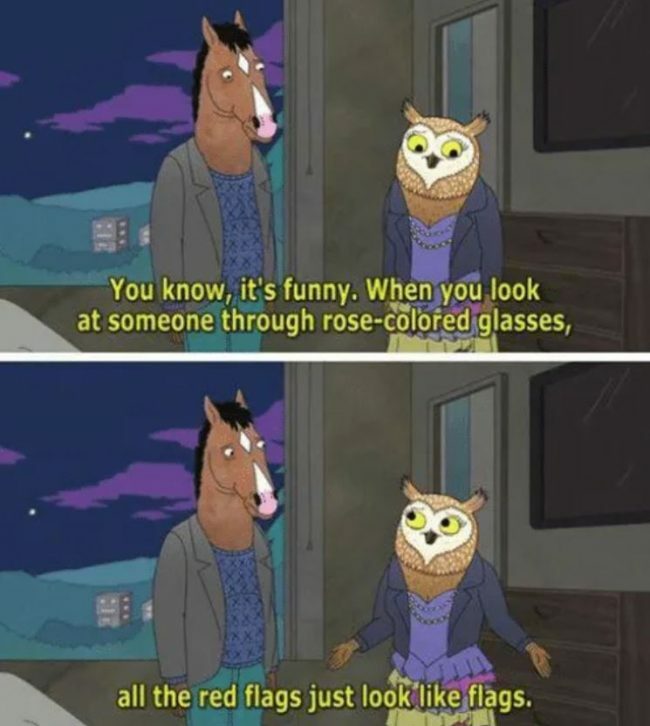 This advice from a BoJack Horseman episode really will change your entire outlook on life. 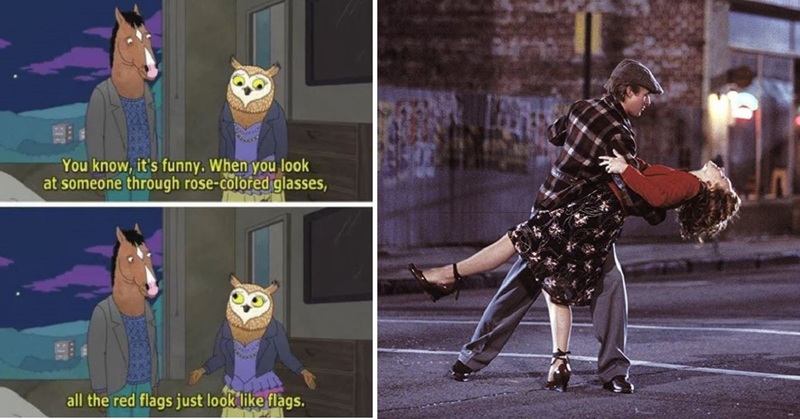 Take off those rose-coloured glasses and see things for how they really are. It will shake your entire world up. It is extremely unhealthy if someone in a relationship relies on you for their sole source of happiness. You both should add happiness to each other’s lives but shouldn’t DEPEND on each other for happiness. It’s the key to a healthy relationship, folks! Your partner should be super stoked about you achieving your dreams and vice versa. If they aren’t supportive and encouraging you to push yourself, then they are holding you back. You both have to be committed to giving each other 100% all-day every day. Relationships aren’t always easy, you both constantly should be working at improving both yourselves and your relationship. 15.) It’s never you vs your partner. It’s you and your partner vs the problem. This is such an important fact to remember whenever you two are in a fight. Why not battle the problem together rather than fighting each other and in turn making the problem worse? If you and your partner are ever locked in a conflict, consider the rule of ten. Will it matter in 10 minutes? 10 hours? 10 days? 10 months? 10 years? If the answer is 10 years then it is worth fighting about, although, try to discuss it rather than arguing over it. This rule will save you from SO MANY needless fights and tears. Trust us. This is probably one of the most heart-breaking things to realize when in a relationship that isn’t working but it’s true. Love isn’t enough if the relationship lacks trust, loyalty, respect, dedication and a whole lot more. If you love someone it still doesn’t mean that you are destined to be together. If your partner leaves you because you aren’t making them happy, you can’t hate them for that. A whole lot of anger comes with a break-up but if you truly care for your partner, be happy for them that they’ve figured out how to be happy. It wasn’t meant to be and you are both moving onto better things. When you break up with someone or someone breaks up with you, it really is a good thing. It gives you a better idea of exactly what you are NOT looking for. Love is your everyday choices and how it affects you and your partner.